1. The Oath taking chart overall is not good and it threatens the longevity of the Government. 2. The incumbent CM will surely face backlash from his own men. 3. The period of June 2019 to April 2020 (Especially August 2019) is going to be critical and the Government is likely to fall. 4. Alternatively to point no 3 above, the incumbent CM is likely to be replaced due to Patidars, OBC, etc agitation in the month of August 2019. After my write up on Gujarat Elections, now the results are out and whatever one may say, BJP has got a tough competition from Congress and the three youths from Gujarat. If one compares the past, BJP has got the lowest tally in the last 22 years. Immediately after the Oath taking ceremony, I tweeted stating the timing of Oath is not proper. Refer the copy of my tweets attached. Now I will analyse the Oath taking chart threadbare and let us see how is it going to be for the new CM to Govern for the next 5 years. Following is the Oath taking chart. The Ascendant /Lagna rising is Aquarius at 20 deg 44. 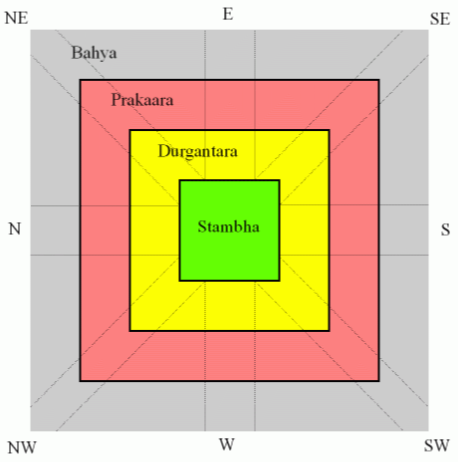 The Lagna is in the star of Purvabhadra ruled by Jupiter. Jupiter is in the 9th house along with Mars a natural malefic. The Jupiter is the lord of 2 and 11 of the oath taking chart and it is lord of Lagna and 10th house from Moon in Pisces. The 2nd house denotes the “Family” of the Bharatiya Janata Party within Gujarat. This represents the CM and his council of ministers. These people are the members of the family. 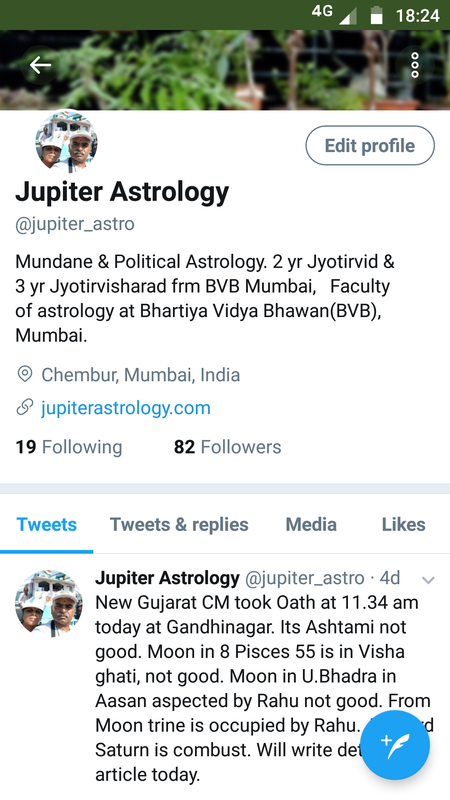 Jupiter from Moon sign is lord of 10th which represents Government. Since it is with Mars it signifies internal rift that may arise in future. Let us see later on the timing of when this is likely to happen. It will be dealt with separately later. –	Tithi is Shukla Ashtamai which is avoided for good occasions as it is said to be Rikta denoting Zero or Empty. –	Vaar is Tuesday ruled by Mars. Here again auspicious work is not done on Tuesdays. It is ruled by Mars and it is placed in the 9th house and in 8th house from the Moon. –	Karana is Vishti which is not a good one. –	Nakshatra is Uttarabhadrapada ruled by Saturn. It represents twins, back legs of the funeral cot, a snake in the water. Its deity is Ahir Budhyana, the Serpent or “Dragon of the Deep”. Its lord Saturn is lord of Lagna and it is placed in the 11th house but it is Combust being close to Sun degreecally. In Oath taking charts the following houses play very important role. –	First house which represents the CM itself. This is as stated earlier is Aquarius. It is ruled by Saturn in Sagittarius at 6 deg 37. It is in the star of Moola ruled by Ketu and this Ketu is in the 12th house. The dispositor of Saturn is Jupiter and it is placed in Libra in the 9th house in an inimical sign along with natural malefic Mars. Though house wise it is in the trinal 9th house. –	4th house. This signifies the Opposition. In this case there is no Opposition per se, but we cannot ignore the Congress which has got a sizeable no of seats. Moreover the number of seats with which BJP has won with majority is just 7 seats. So Opposition though not in existence will play a major role in future and that is Indian National Congress. The lord of 4th house is Venus and it is placed in the 11th house. It is close to Sun and is Combust. House wise it is well placed. However its combustion is not good. So partly it is placed good house wise. Venus is in the star of Moola and its lord Ketu is in the malefic 12th house. –	The next is the 7th house which represents BJP’s allies. Here there are no allies. However, the Patel community elected MLAs are vulnerable in future for changing boat. The lord of 7th house is Sun and it is placed in the 11th house. It is in the star of Moola whose lord Ketu is placed in a malefic 12th house. –	The next and most important house is the 10th house which signifies Government. The 10th house is Scorpio whose lord Mars is placed in the 9th house in Libra. It is at 16 deg 28 which corresponds to Visha Navamsa. This portends danger in future. –	Lastly the 9th house is very important (at least in the case of Gujarat) which signifies Caste, Religion, Reservations arising out of these, etc. The 9th house has malefic Mars which as stated earlier is in Visha Navamsa. It is with Jupiter the lord of 2nd the family of BJP (its elected MLAs). So, this Mars will create reservation issues in the future due to various caste dimensions. Moon is important as it forms the part of muhurta. Strong Moon is essential for choosing a good muhurta and ensures longevity of the government. It should not be afflicted any way or conjunct with malefics. In the oath taking chart, Moon is in Uttarabhadrapada nakshatra and it is in the “Aasan” section. Moon in the Aasan aspected or conjunct malefics is not a good sign. As per the dictum it destroys the King and in this case the CM. The Moon is aspected by Rahu. Moon is in the Gajapti section which denotes slow in action and his policies. So, overall the Moon’s placement is not good. This is another indicator of longevity of the Government. Here the Kota Swami (The CM itself) is Moon and it is placed in the “Bahya” or Exterior. Its not a good placement at all by any standards. The Kota Pala (the Care taker or In this case the Opposition who keeps the ruling government under check) is Jupiter and it is placed in the “Stambha” or Interior. In fact the placement should have been vice-a-versa. So this is not a good placement and it will certainly bring in hurdles to the CM. From the above, Venus period from June 2019 to April 2020 will be testing times for the CM especially during the month of August 2019, when it will be the period of Venus/Sun. The Dasa and Antara lord Venus and Sun will be afflicted by transit Ketu and retrograde Saturn. The transit Venus and Sun will in the month of August 2019 pass through the sign Cancer which will have a debilitated Mars also. The sub-period Ketu represents Mars as Mars aspects Ketu. Mars is in the 9th house of religion, caste, reservations, etc. Mars being in Visha Navamsa will create disturbances in the Government and due to this the incumbent CM is likely to be replaced. ← Gujarat State Elections 2017 – A triangular fight? Looks like trouble has already started in the form of Nitin Patel.